On the air for 26 years straight, Doctor Who is still a science fiction institution. Now fans of the show can see how it all started with Doctor Who: Beginnings. This collection contains the first three serials, 13 episodes in all, presented in one attractive slipcased set. Including the introduction of the time traveling doctor and his granddaughter, the first appearance of the Tardis, the origin of the Daleks, and the only serial to entirely take place in the Tardis, this set is a fantastic collection of some great shows. Over the course of the shows presented here, Doctor Who went from being an unusual new series to a huge success, and after watching these programs it is easy to see why. There is some debate over the correct name for the first Doctor Who story. Since the BBC didn't give names to entire serials at this point, just the individual episodes, some fans prefer one name over another. There are also conflicting reports as to how the serial was referred to internally, with several different names being found on different records. I don't think it really matters much, so I'll go with the most common name, and the one that is used on this set: An Unearthly Child. 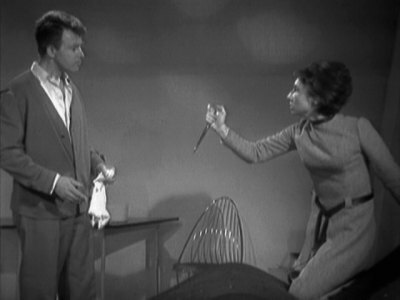 A pair of teachers, Barbara Wright (Jacqueline Hill) and Ian Chesterton (William Russell) are a bit concerned about one of their students, Susan Foreman (Carole Ann Ford). She's a strange girl. Susan is very brilliant and yet doesn't know many common facts like how many shillings are in a pound. She's also very secretive about her home life but when Barbara gets her address from the secretary and goes to visit her at home, she finds the address leads to a junk yard. Barbara convinces Ian that they should follow Susan home one afternoon, and they are astounded when she does go into the junkyard. Following her in, all they find is a lot of junk and a police call box. 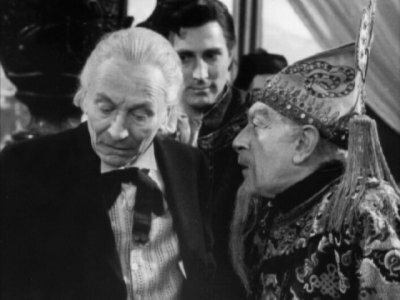 While they are searching for the girl, a grumpy old man (William Hartnell) comes in and starts questioning the two teachers, asking them what they are doing and why they are there. He denies knowing anything about Susan, but when Ian hears her voice come from inside the police box, he pushes past the old man and rushes into it. Inside he finds something that he could never have imagined. The interior is huge, much bigger than the outside, and there is Susan, standing at a control panel. They school girl explains that they are in the TARDIS, a name she coined from the description of the machine: Time And Relative Dimension (sic) In Space. The old man, who calls himself "Doctor", proclaims that the teachers can't leave the Tardis since they might tell someone what they've seen. He then turns some dials on the panel, the center column starts rasing and falling, and the two teachers pass out. When they awaken, they find themselves in another time, thousands and thousands of years in the past. Exploring, the Doctor is captured by a cave man after the primitive sees him lighting his pipe. His tribe has lost the secret of making fire, and with winter setting in, it's vitally important that they rediscover it. Who ever can make fire is the leader of the tribe, and the caveman, Kal (Jeremy Young) wants to usurp the current leader's position with the help of the oddly dressed man he's encountered. What follows is a standard 'captured-escape-captured again' story with tension within the cave man tribe equal to the tension among the time traveling group. It has often been claimed that Dr. Who was a created to be a children's educational series, and I've always wondered where that description started. Viewing this first series, it doesn't feel much like a children's show, and there's not a lot of educational value, especially in the very first episode. The Doctor isn't a very likeable person in these first episodes, coming across as a selfish petulant old curmudgeon, and it would be hard to see young children really taking to him. As for the educational aspect, devoting the first four episodes to basically relate that fire was important to primitive man seems like a bit of overkill. Children's show or not, the first episode is excellent. It introduces several mysteries that will be one of the things that bring people back to the series week after week for decades, and also sets the tone for these first few seasons. One of the best scenes in when Ian and Barbara first enter the Tardis, not being able to believe that it's bigger on the inside than the outside. This is a scene that will be replayed over and over again with different companions over the years. After the first episode, the story goes down hill a bit. You can tell that the writers are trying things out with these new characters, and the resulting story, though not bad, does drag a bit. The discussions between the cavemen about who is going to be leader and how important fire is to them, all in Tarzan-speak (Kal make fire then be leader!) gets old fast. The plot is rather simple, and the stakes never seem that high. Since we know that all of the Doctor's party could make a fire and thereby prove themselves of worth to the tribe, the tension just isn't there. Flaws and all, this was a good series that is still enjoyable after all these years. Historically it's rather significant too. Not only does it introduces the Doctor and his habit of having companions, but there are some interesting trivia in these episodes too: Susan reveals that she named the Tardis, and we also see that it's camouflage ability breaks when they go into the past. Both the Doctor and Susan mention that its shape should have changed and are surprised that it hasn't. After taking off in a hurry from Earth's pre-historic past the Doctor and crew land on a planet where everything is dead, in the middle of a forest that has been turned to stone. Thus starts the story that would introduce the Doctor's most popular nemesis: the Daleks. 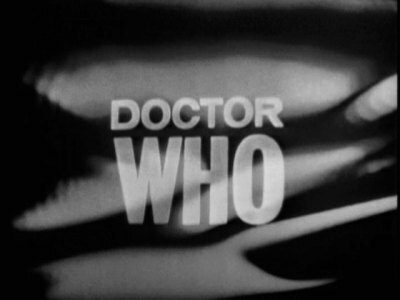 This seven part serial also boosted the show's ratings significantly and is often attributed for gaining the Doctor his early fans. Landing on the planet that they would later learn is called Skaro, the Doctor checks the atmosphere and radiation levels, finds that they are acceptable, and then the group leaves to explore. After they do however, the camera zooms in on the radiation meter, where the needle is rising into the dangerous level. Outside the ship they discover a petrified forest where everything has turned to stone, even the flowers. Exploring more, they see a huge city, apparently dead, off in the distance. The Doctor is determined to explore the ancient ruins, but Ian and Barbara want to go home and have no interest in the exploring further. With night falling, they return to the ship. There the Doctor rigs the Tardis so that it won't dematerialize. He claims that the fluid link is out of Mercury, and that he doesn't have any on this ship. The only thing to do is see if they can find some in the city that they spotted. After a trek to the city, they discover it to be empty, with room after room of idle equipment. It's not as dead as they assume however. The entire party is soon captured by the Daleks, survivors of a terrible war with their enemies the Thal. At the end of the war, 500 years earlier, Neutron bombs polluted the surface of the planet. 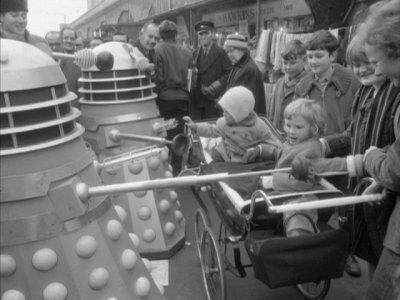 The Daleks descended to the lowest levels of their city but still mutated to the point where they needed robot like vehicles to move them around. Thinking that the Doctor and company are related to the Thals they are questioned until the symptoms of radiation poisoning start to manifest themselves in all of the travelers. Meanwhile the surviving Thals, a people who have developed an anti-radiation drug arrive at the Tardis looking for food. How will the Daleks react when they discover that their ancient enemy, now a race of pacifists, is at their door? This is a great series. Whether by plan of by accident, writer Terry Nation came up with the type of story that would serve the show well for years. In this story the Doctor is playing for high stakes, not only his own life, but those of the rest of the inhabitants of Skaro as well. There are puzzles for the Doctor and his companions to solve, and just when you think that they've escaped and are free, something else pops up that stops them from leaving the planet. The script is excellent, and really succeeded in all of the places where the first one failed. Not only was the tension level kept high for the course of the story, but the main characters are developed nicely. The relationship between Ian and the Doctor is explored more, with Ian being companionate to a fault, and the doctor only interested in himself. This leads to some interesting moral dilemmas that are much more sophisticated than one would think would be included in a children's show. When Ian and the Doctor argue about using that pacifist Thals to attack the Daleks so they can obtain the item they need to leave, you can see each person's side, and no one is clearly in the right. I've never really liked the Daleks as an enemy that much. I mean they can't walk up a flight of stairs and they have a toilet plunger as a weapon. How intimidating is that?? In this series they are scary and formidable though, and their form makes sense in the context of the story. Their monotone electronic voice is eerie, but their total lack of emotion is what really makes them into great villains. When the Doctor tells them that releasing excess radiation into the atmosphere would kill all of the Thals and be murder, a Dalek replies "No - Extermination." as if those people were vermin or bugs. This story has a lot of action, with the main characters constantly in danger, and some very nice SF touches. 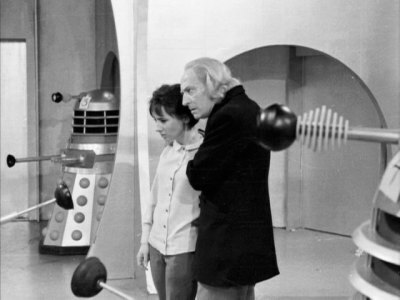 Though there are a few parts that drag just a bit, that is made up for by the classic scenes that are contained in this serial: The Dalek claw appearing from under the Thal cloak and Barbara being cornered by a Dalek suction cup at the end of the second episode are two good examples. And while the defeat of the Daleks at the end of the story seemed a bit simplistic, that is mainly tainted by knowing what formidable agents of evil they would become in future episodes. Thought they would later become a bit silly and almost parodies of themselves, this first encounter with the Daleks is a classic Dr. Who story. The weakest story in the set, this is also the shortest. Lasting only two episodes, this is the shortest serial from Dr. Who's original 26 year run. It's also the only story to take place solely on the Tardis, and with no one besides the doctor and his companions. Soon after dematerializing from Skaro, something happens inside the Tardis: There's a bright light and everyone is knocked unconscious. Getting up an undetermined amount of time later, the entire crew starts acting odd. 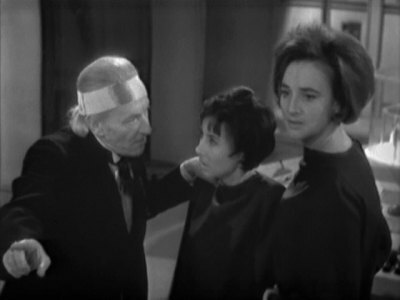 Ian isn't sure where he is, Susan attacks Ian with a pair of scissors, and the Doctor becomes paranoid and thinks the two earthlings have sabotaged his ship. Not only that, but the Tardis itself is behaving peculiarly. When everyone wakes up, the doors to the ship are opened, but whenever anyone walks near them they close. The control panel gives anyone who touches it a bad shock, and the scanner won't show what's outside the ship. Not only that, but all of the clocks and watches on board melt. Could some force or entity have entered the Tardis? Are the travelers under some sort of spell? How can they ever get home again? While there are some good moments in this story, overall it doesn't hang together quite as well as the other stories. Feeling a bit rushed, and with an ending that's a cop out, this story is worth viewing, but probably won't get many repeat screenings. Part of the reason for this short story's falling flat is that it was a filler serial. Dr. Who originally had a 13 episode contract, and after the Dalek story they only had two more shows that were assured of being aired. Added to that was a tight budget. To solve both of these problems it was decided to create a two-part story that takes place all in one set with no other actors. The biggest problem that I had with this story is that the resolution of the problem didn't explain why everyone was acting so oddly. Why did Ian try to strangle the Doctor and later Barbara? Why did Susan act like a maniac? It's never explained. The other problem is that the story isn't being driven by plot or characterization. There really isn't much of a plot, the Tardis has stopped and no one knows why, and the characters aren't developed either. With everyone acting strangely and out of character, it's hard to claim that viewers will learn anything new about the Doctor or his companions over the course of this show. This one was apparently done fairly quickly too. Not only are there a lot of holes in the story, but there are several gaffs in the production that were never corrected. There is more than one occasion when someone flubs their lines, but the show keeps soldiering on. Guess there wasn't enough time for retakes. There were some good moments in this serial though, that prevent it from being a total failure. 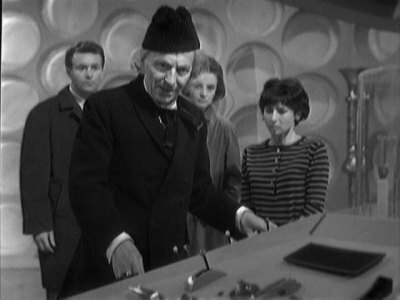 More of the Tardis is seen including the fault detector that keeps track of the ships status and the girl's bedroom. 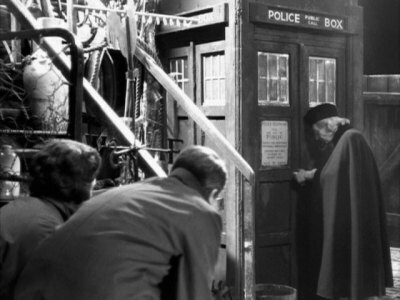 The Doctor name-drops for the first time, telling Ian that the cloak he lent them was obtained from Gilbert and Sullivan, and the scene where the Doctor apologies to Barbara at the end marks a change in his attitude toward the pair from Earth. Of course the end of this series also has the only footage from the next story, Marco Polo that still exists. These three stories, 13 episodes in all, come on three DVDs in two single width keepcases. (The Daleks and Edge of Destruction discs are in the same case.) Both cases fit in a nice slipcase. A nice package that fits in well with the other Dr. Who DVDs that have been released. If you've seen any of the other early Dr. Who DVD releases, you'll be happy to know that this set looks just as good as the previous serials. The full frame black and white video has been restored to its original appearance and looks absolutely wonderful. The contrast is excellent and the level of detail is strong. The picture is just a tad on the soft side, and the image is a bit jerky when the camera makes quick pans but these are very minor and hardly worth mentioning. On the digital side things look just as good, with only a hint of aliasing in one or two spots. Another outstanding restoration. The two channel mono soundtrack, like the video, has been restored to its original splendor. The sound is clear for the most part and pops, background hiss and extraneous noise has been removed. There is some distortion in parts and peoples voices tend to drop when they turn away from the microphone but these defects certainly originate with on the master recordings. A very good sounding set of programs. The BBC has been spoiling us Dr. Who fans by releasing discs that have a large amount of extras. This set is no exception. All of the shows have the optional pop-up notes that appear during the episodes which contain a lot of interesting information. In addition, there are copious bonus items spread across all three discs. 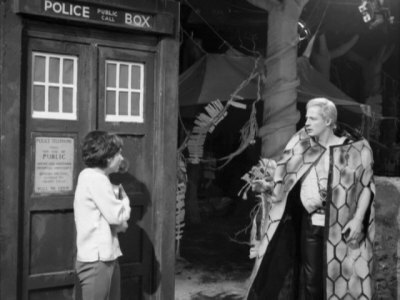 This first story has commentary tracks on episodes one and four with producer Verity Lambert, director Waris Hussein, Carol Ann Ford (Susan) and William Russell (Ian) along with moderator Gary Russell. These were very fun and a great addition to the set. This disc also the original pilot episode which was discovered in a mislabeled film can in 1978. 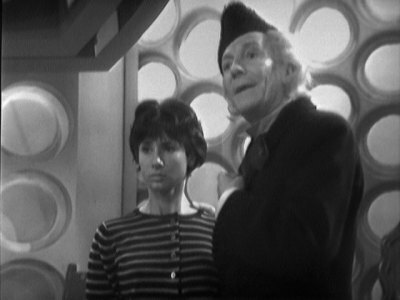 There are three versions of the second act, after Ian and Barbara enter the Tardis, and all three of them are presented. This was very interesting to watch. Not only are some verbal flubs left in, but some small things have been changed. Susan makes an ink blot on a piece of paper after her teachers leave her in school (for some strange reason) and some lives are changed. The biggest difference though is with William Hartnell. In the pilot he is much more aggressive towards the teachers and even more unlikable. His character was toned down a lot in the aired version of the first episode. The pilot also has a commentary track with the same participants as the regular episodes. 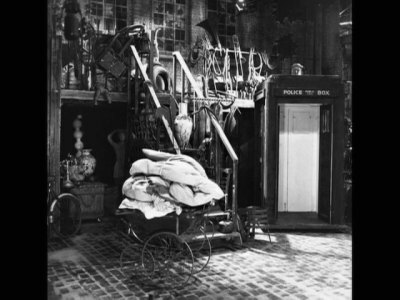 A photo gallery is included that has a lot of shots of the decorated sets, including an image of the Tardis in the Foreman junkyard with the doors wide open. There are also behind the scenes pictures and photos of the cast relaxing. A very nice collection. Episodes 2, 4, and 7 have commentary tracks with producer Verity Lambert, directors Christopher Berry and Richard Martin, Carol Ann Ford (Susan) and William Russell (Ian) along with moderator Gary Russell. This disc also has a featurette on the genesis of the Daleks (pun intended) where the monster's origins are examined including their design and manufacture. There is also another photo gallery with has some great pictures including some color photos of the filming. This disc has the most bonus material by far. Though there isn't a commentary track for either episode, the second episode does have an optional Arabic soundtrack. 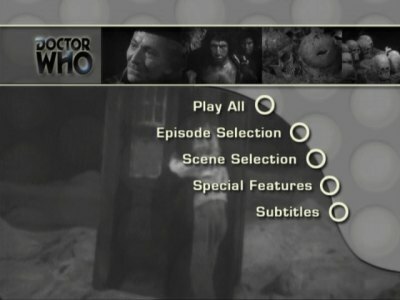 The first featurette on this disc is Doctor Who: Origins. This nearly hour long documentary discusses how the program came about, talking about the changes at the BBC, the people behind the scenes as well as the actors who stared in this first season. A nice background to the show. Over the Edge is a half-hour featurette on the third serial, Edge of Destruction, and Inside the Spaceship is a ten-minute short on the Tardis and its design. Masters of Sound is a very nice look at the music and sound effects of the show that runs 12-minutes. There is a script for "An Unearthly Child" in pdf. Format as well as a series of excerpts from The Radio Times discussing the stories in this set. (It's interesting to note that when talking about the end of the second story, they mention that "the travelers in alliance with the Thals have destroyed the Daleks for good..." If only they knew how popular the robotic pepper shakers had become.) There is also a piece on Marco Polo, a serial that is now lost. While no video survives of the four Dr. Who story, Marco Polo, the off-air soundtrack does still exist as well as many production stills. From these elements the seven-part story has been reconstructed and condensed with the audio playing over selected stills. This runs only half an hour, cut down dramatically from the original stories nearly 3 ½ hour running time. While it is a very good reconstruction, I can't help feeling that a lot was left out. Including the entire soundtrack in mp3 format would have been great, or the shooting scripts in pdf form. The photo gallery on this disc includes a large number of pictures from Marco Polo, all of them in color. which are nice to see. I've always enjoyed William Hartnell's take on the doctor. It's very different from the others, he's almost an anti-hero, and his combative style is rather intriguing. He's not as charismatic as Tom Baker, and not as classy as Jon Petwee, but he brings an almost regal quality to the role that makes him fun to watch. This is a great set with some entertaining and important stories and episodes. These first three stories (and an abridged mock-up of the fourth) are belong in every Doctor Who collection. The restoration team has done another outstanding job giving viewers an immaculate picture with a nice sounding soundtrack. That alone would be enough for a strong recommendation but when you add in all of the great bonus material buying this set is a no-brainer. HIghly Recommended.